As I sit writing this in a cafe in Phnom Penh’s Russian Market neighborhood, an elderly man with no legs is dragging himself along the rain-soaked street outside. Cars and motorcycles narrowly miss him, while pedestrians snake their way around his contorted torso. A few drop a 500 riel note into his bucket and hurry away. It is not a common sight in Phnom Penh, but common enough for the bile to rise up in anger. In front of me lies a copy of the Cambodia Daily and a small, page-five article about a soon-to-be published report that found less than 4 percent of disabled Cambodians receive financial assistance from the government, despite legislation being passed in 2011 that entitles those with “severe functional impairments” to a monthly pension. The study, authored by three Australian researchers, was also the first to estimate the median cost of having a disability in Cambodia: an additional expense of $40 per month. The pension for disabled people, supposed to be paid by the Ministry of Social Affairs, is just $5 per month. The divide between the haves and have-nots in Cambodia is stark (again, as I write, the elderly man has just avoided the cumbersome tires of a tinted-window Hummer) but the position of the disabled must be one of the starkest. The government estimates that just 2 percent of the population has a disability, though the UN global figure of 15 percent is probably much closer to the real number. Meanwhile, according to the Cambodia Daily, the estimated poverty rate for households with one moderately or severely disabled person is 18 percent, higher than the national poverty rate of 13.5 percent. With the additional expense of $40 per month, identified by the study, it would push the poverty rate up to 34 percent. “Without accounting for the cost of disability, national estimates of poverty are under-estimated,” the study’s author, Michael Palmer, told the newspaper. 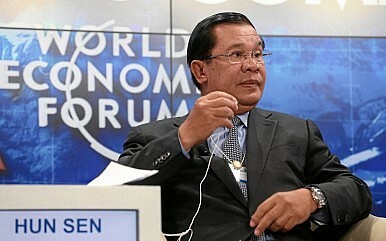 Prime Minister Hun Sen, who lost an eye while fighting for the Khmer Rouge, has expressed platitudes in the past. He told a crowd in 2002 that “as a disabled person myself… we recognize that poverty and disability have certainly a very close link, and disability is a complicated social and economic issue requiring the regular attention of the royal government.” But his government is failing by even the standards it has set for itself. In August, Ngin Saorath, director of the Cambodian Disabled People’s Organization, confirmed that the National Election Committee (NEC) had refused his request that during voter registration it collect information on the disability status of people so that they could be better accommodated on election day. “We believe that one vote by a disabled person is equal to a vote by a normal person,” he told the Phnom Penh Post. The NEC’s excuse was that its servers were “full” and the additional work would create “many difficulties in terms of technical work.” A year earlier, Saorath told the media that following a voter registration test his NGO discovered that “not many people with disabilities were registered.” At the time, the NEC claimed a lack of finances for not being able to do more. Like much about the Cambodian government, what appears good on paper manifests itself very differently in real life. All of the disabled rights activists I have spoken to over the last two years agree that access to employment is one of the (perhaps most) important ways for disabled people to overcome poverty. In 2010, the government introduced a sub-decree to the 2009 Law on Protection and the Promotion of the Rights of Persons with Disabilities that requires disabled people to make up at least two percent of the workforce of public sector institutions with more than 50 employees, and at least one percent of the workforce of private business with more than 100 employees. A deadline was set for 2013. Six years later, there is little in the way of statistics for private businesses, while the latest figures for state bodies show that of the 194,596 civil servants working in 40 government agencies, 2,460 have disabilities, so roughly 1.3 percent. On top of the quotas, the sub-decree also stipulated fines for failing to achieve them: 50 percent of a civil servant’s monthly gross salary for state institutions, and 40 percent of an employee’s minimum monthly salary at private companies. Writing in Southeast Asia Globe in April, I revealed that after six years not one fine has been paid for failing to meet these quotas. This was confirmed by Chuor Rattanak, director of the Persons with Disabilities Foundation (PWDF), the government-affiliated body tasked with collecting fines. An anonymous source told me that staff at the Disability Rights Administration (DRA), the body under the Ministry of Social Affairs tasked with imposing the fines, didn’t even know how to file a claim against companies or state institutions flouting the law. The source said that because of this, it “makes the quotas pointless” and opined that this was likely the result of the government not taking the issue seriously enough. Of course, one can always point to finances as an excuse for the paltry services offered to the disabled. As of last year, Australia was the largest foreign donor to Cambodia for disabled services, but its money only accounted for less than $1 per person. But what about the government coffers? It might be a trite comment, but if it can spend $383 million on its military in 2016, up 17 percent from the previous year, why can’t it spend even a fraction of that on disabled people? Why has it failed to adequately pay disabled people the $5 a month pension as promised (even if this is a pittance and should be more)? If the government’s statistic of two percent of the population having a disability is to be believed, it would only cost $3.6 million a year, one percent of the military budget. Wouldn’t that be better use of the money? Five years after the law was passed, pilot projects have only begun this year in Pailin province, for just 320 participants. It is not known when or how this will be extended nationwide. But money isn’t the only answer. It must be combined with political will. And that is where the government is lacking. It might be full of platitudes on days like the Cambodian Day of Persons with Disabilities (December 7), when Deputy Prime Minister Men Sam An took the time to say that “all of the state’s ministries and institutions must enable disabled people who have the ability to exercise their right to work without discrimination.” But when the cameras are packed away and the crowds disperse, as Saorath said, “We don’t see any commitment from the budget to help with infrastructure.” Indeed, Weh Yeoh was correct when he said that “in this country, people with disabilities are invisible.” Without a major change in the government’s attitude, many Cambodians with disabilities will not only remain invisible but languish in poverty. What's Behind the Death of a Prominent Cambodia Government Critic?Stop Hyping Up Sam Rainsy's Return to CambodiaThe Real Danger of Cambodia’s ‘Gay King’ EpisodeCambodia’s Democracy and EU Trade Privileges: Taking a Long-Term ViewWhat’s Next for Cambodia After its 2018 Elections?